I’m not 100% sure on the date of this photo, but I’ll place it in the late 1940s, as Life photographer Nina Leen did a great many photoshoots for the magazine in this period. The statue of Horace Greeley sits astride the big Christmas tree as perfect afternoon light casts shadows upon the corner of 33rd and Broadway. Here’s a slightly different angle of the same scene. Gimbels, at left, one of America’s largest department store chains in the 1940s, was presumably filled with shoppers. 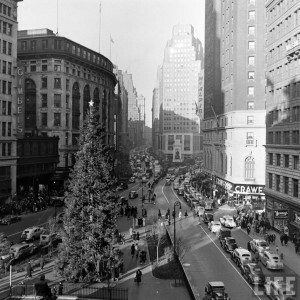 The building to its north was is Sak’s Herald Square, the ancestor of the far swankier Saks Fifth Avenue. Out of view at 34th Street is, of course, Macy’s. The Hotel McAlpin, at right, was once the biggest hotel in the world when it was built in 1912. The storefront that sits at the corner of 33rd and Broadway is Crawford’s men’s clothing store. Today that same corner is occupied by Game Stop. On the southeast corner of 33rd and Broadway was Whelan’s Drugstore, an New York drug store and soda fountain chain in its heyday during the 1940s and 50s. Its business neighbor was Young’s hat shop, specializing in Stetsons.